There's immediately smoke on the nose, but very discreet, with some burnt and crisp peat in addition. Behind that a malty sweetness appears, to which yellow fruit aromas - mainly peach, but also some lemon sorbet - are added as well as vanilla notes. At the end a slight hint of ozone. Creamy and slightly oily on the palate. First a subtle fruit sweetness with a bit of citrus, surrounded by fine smoke and peat. Then a warming mix of spices spreads over the palate with black pepper, clove, some nutmeg and fresh oak. This warmth becomes even more intense with the 2nd sip. The finish is of medium length to short, dry and slightly warming. Smoke with some ash and dry oak towards the end. More notes of citrus on the nose when a few drops of water are added, but also more smoke and ozone. The malty sweetness and the fruity peach notes are strongly pushed into the background. First a little bit sweet on the palate, then immediately dry and warming with spices such as pepper, clove, nutmeg and oak, with a hint of peach towards the finish. The finish is short, warming and very dry with smoke, ash and ozone. This single malt whisky was part of a blind sample tasting organized by whic.de. To me, this whisky was made on the Isle of Islay, due to the special kind of peaty and smoky flavours. However, not that intense and pungent as from distilleries from the South, so I thought of Caol Ila. The dram is already well balanced with a pleasant mix of fruitiness, warming spices and peat smoke. Young, but not too young. I thought of 6 to maybe 8 years of age. 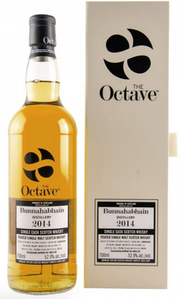 In the end it was a 3 year-old Bunnahabhain from an Octave cask. Wow - I wasn't expecting that! Well done. This small type of cask has already delivered a lot of flavours to the spirit. A good sipping dram in front of a logfire. I thank Leonie, René and Arne from whic (Whiskycircle) for the complimentary sample and the image!